Two boat owner! Must be sold! Lying · Seattle, WA USA -- At Our Docks! Seattle, WA USA -- At Our Docks! Generator hours are unrecorded. Fuel consumption at 7 pgh is a close estimate at 13.7 knots cruise speed. It would be considerably less at displacement speeds. Northern Lights Generator just had a new starter. 4-8D House batteries are about 2 years old. One start battery the same age and one generator start battery also the same age. There is a small 300 watt inverter at the lower helm in order to plug in a laptop to run Navigation software but the boat is absent a larger inverter. These engines just had a mechanical check up. The mechanic said they started up quickly with very limited, cold engine smoke. Hi Star was a well regarded Taiwanese builder in the late 80's whose business appears to have started, run for about 4 years, then stopped due to exchange rates of the Taiwanese / US dollar. Hi Star resumed construction with larger yachts. Arden, as reported by the seller, was a designer who at some point went on to Ocean Alexander, though I don't have more information (and will welcome feedback from people knowledgeable about this). Total LOA of this boat, with dinghy davit is about 46 feet. Gel coat hull is black and could use some detailing and touch up. Waterline Boats / Boatshed does not independently verify capacities and dimensions, which are reported from seller-provided information and/or literature. Entering the salon from a large, teak covered cockpit you see the galley on the starboard side, a hide-a-bed couch on the port and the lower helm straight ahead on the port. This area is very roomy and has great visibility with windows all around. Directly ahead and center are the steps down to the master cabin forward with a center queen berth. To the starboard side is a good sized head with electric flush toilet and a nice shower. On the port side is a VIP guest cabin with good size twin bed. Interior is largely wall coverings, and cabinet fronts are white laminate. Carpeted floors appear in good condition. Heat is supplied by a Webasto diesel furnace and engine heat through Red Dot Style heating units. The flybridge on this vessel is accessed by a stainless ladder port side from the cockpit. The bridge is roomy with lots of seating and has an full enclosure in good condition. This boat has largely been used for many years on Lake Washington. It has a Sony stereo and multi CD Changer with big speakers mounted on the Radar arch plus plenty of speakers down below. Raytheon Mariners Pathfinder 2500, Raytheon D600 Depth and Speed, Ritchie Compass (2), Uniden Polaris VHF (Flybridge), Garmin 188C Colormap Sounder. All Nav electronics appear as original equipment. Most equipment on the boat appears to be either original or of original type and style. The Arden line of boats built by Hi-Star in Taiwan are considered to be of a very robust build quality. This 40 foot sedan is clean and roomy. Twin 3208 Caterpillar engines have low hours. The open cockpit is covered in teak. It's large enough for entertaining or fishing. Looking closely at this boat there are some gel-coat fractures in corners and some other spots that show wear. They all appear to be cosmetic, but are reflected in the low asking price for what is really a lot of boat for an aggressive price in this broker's opinion. “ Concerned about moorage? Where can I keep this boat”? Waterline Boats on Lake Union in Seattle will offer at least 3 months transitional moorage (at market rate) for this boat. Personal property is excluded from the sale of the vessel unless specifically included in the listing specifications above or in a Purchase Contract. Personal property may be equipment or gear not permanently attached to the vessel including but not limited to: artwork, furniture, entertainment equipment, fishing equipment, TV receivers, recreational equipment, kayaks, tools, and personal appliances. Photos may incidentally depict owners' personal property and are not intended to convey that these items are included in the sale of the vessel unless specifically listed herein. 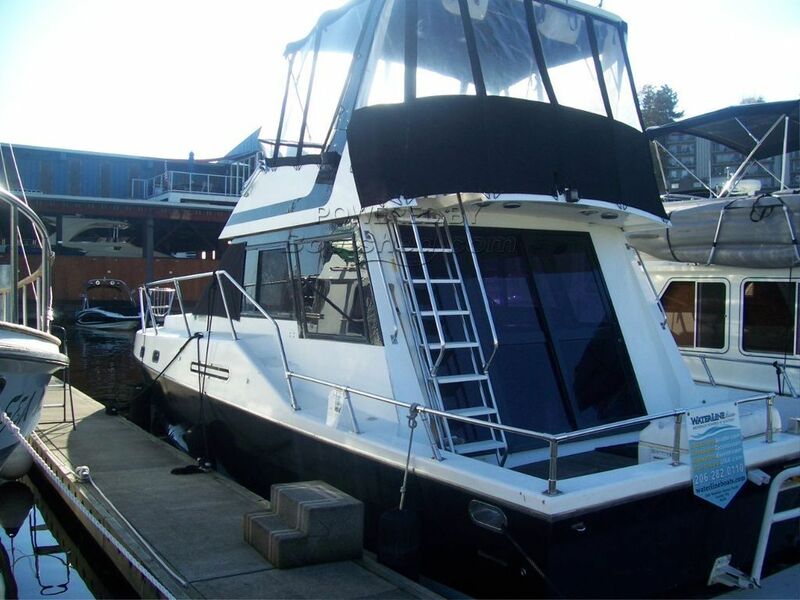 This HI-Star 40 Flybridge Sedan Two Staterooms has been personally photographed and viewed by Gary Buck of Boatshed Seattle. Click here for contact details.